This archive provides access to preserved files generated by the National Science Digital Library community during the project funded by the National Science Foundation (Award Information). The NSDL Digital Repository (NDR) was developed by a core integration technical infrastructure (citi) group which evolved into the Technical Netwok Services (TNS) entity. The project was administered by a team of principle investigators and staff from University Corporation for Atmospheric Research (UCAR) and Cornell University. 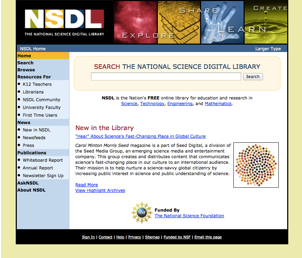 NSDL.org continues to be an online science library with links to high quality science, technology, engineering, and math resources for K-12 teachers, faculty, librarians, students and informal learners. The NSDL service is currently being housed at the UCAR library and this archive is stored at the Cornell University Library. For more information about the history of the NSDL Project, please see the report from the NSF Program Director 1. There is also a NSDL Reflections project which aims to review what the community learned regarding "the NSDL, digital libraries in general, and future projects that focus on e-learning, cyber-learning and dissemination of STEM innovations."